Ending America's workout rut, one Acquapole at a time. Brief: Bring a foreign product into the US. 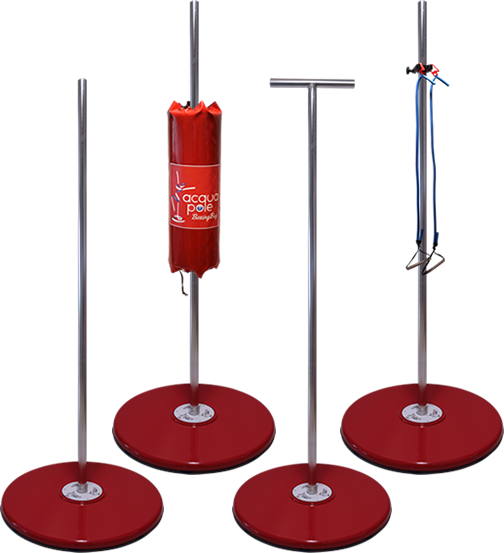 Product: Acquapole, a submerged workout device using a pole as the core to multiple attachments. 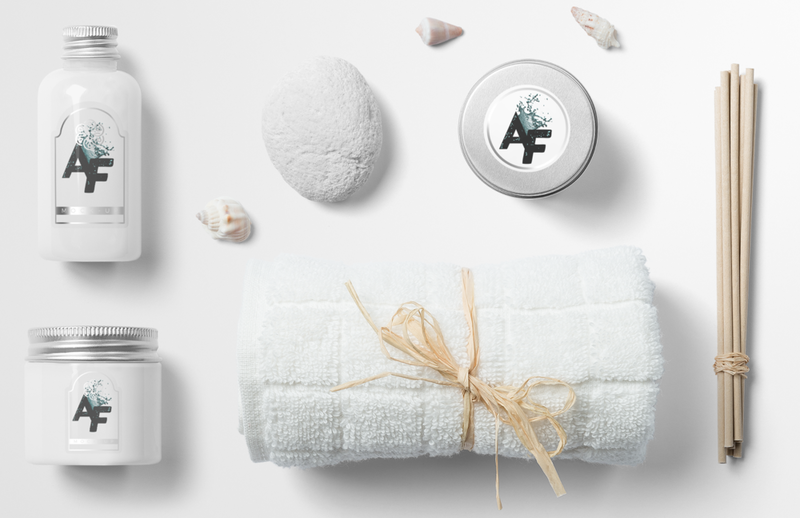 What We Did: Transformed the product into AquaFit, a high-energy, water-focused workout club. Why Now? We are in a country where *50% of people need their gyms, luxury gyms have become a staple, and gym boredom has resulted in Zumba, SoulCycle, and more. 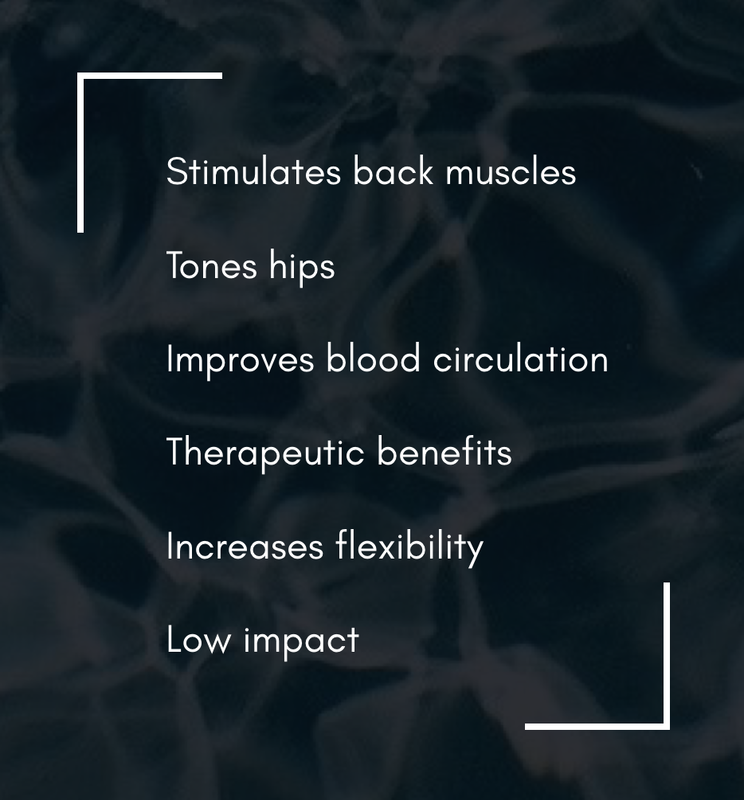 Opportunity: No one has owned the water workout space either as a "fad" or as a serious luxury gym. We sought to make a gym experience that combines fierce workouts with the resistance benefits of a pool. *In a survey conducted by Ad Age to determine the things that Americans cannot live without. 50% of people in the US said they “NEEDED” their gym membership and are not willing to give it up. Strategy: The most gratifying workout. Identity: Capture the kinetic energy of water. Logo for digital, posters, and sharable merch. The logo mimics a cascading wave in form, fanning out to simulate motion when in static environments. Our palette reflects water in any state of motion. Whenever we can we are going to change the AquaFit logo into moving logos. We utilize 3 energy levels to guide gym goers throughout the experience. We are keeping it very clean, almost like a spa to enhance the luxury feel. One of the largest pain points is getting people into a gym, especially when moist, chlorine-scented pool air is blasting into your face. We moved the pool as far away from the front door as possible and use hallways as a filter. The club is 8,000 square feet with a half-size olympic pool, making it the size of a large fitness center able to support many ranges of athlete. We also make sure to include massage and physical therapy by appointment along with saunas to relax the post workout body. Keeping it light and clean like the space we open with what we have to offer. At the top you'll notice the logo in it's relaxing state. As you dive into the class page you'll notice some key features, like the calendar grid to easily find the classes at the day and time you want -Pain Point!- and the ability to choose a class based on difficulty level. When you click on a class a screen appears with a short description. Since we chose and intermediate class the animated logo in the pop-up will reflect the middle tier, churning and flowing. There's also a Spots Remaining number to make sure you will grab the class quickly as there's limited room. A personal pain point we solved is not knowing how to use the tools given to us for the most effective workout. 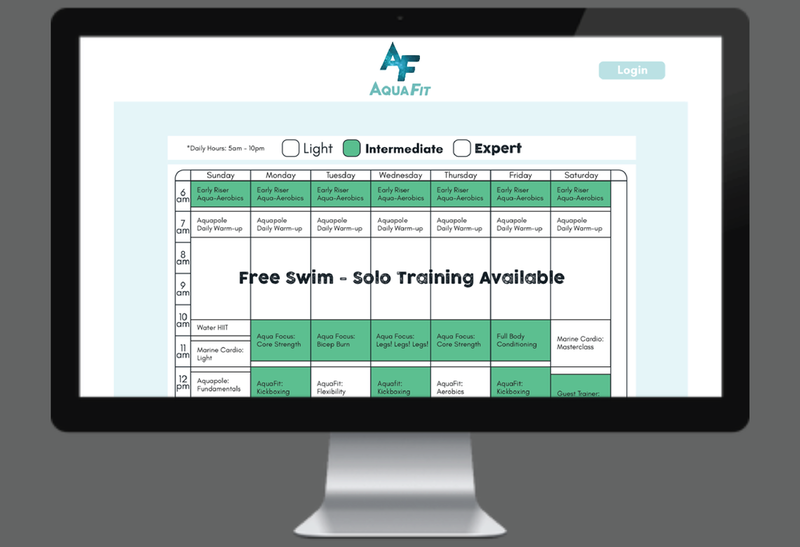 We provided a place online that allows those new to AquaFit to see how it's done and which muscles to engage during. You can plan your workout online before you even come to the gym. This also means you don't need to always partake in a group class, you can motivate yourself to exercise solo. If you forget to do it at home you can pick a virtual trainer at the gym. Then you can follow your workout on a personal screen near each station or big screen to share. We use the logo to enforce level of intensity. We'll use Instagram as our storytelling medium. Our social executions will revolve around motion and movement. Building a premium aquatic center requires a bit of money, especially in urban areas. We would start by leasing out sets of equipment to existing gyms, like the spread of Zumba, we would have special trainers dedicated teaching group classes. Our flagship location would be in Denver, Colorado because the city is landlocked and the city has the most people with gym memberships and use them regularly, surpassing even Southern California which is known for fitness. Classes run at $30 each or $100/month for a membership that includes additional perks like access to massage and physical therapy. We are injuring ourselves too often, water provides a safer environment. If something takes us away from an experience at a low-point, we're more likely to give it up.